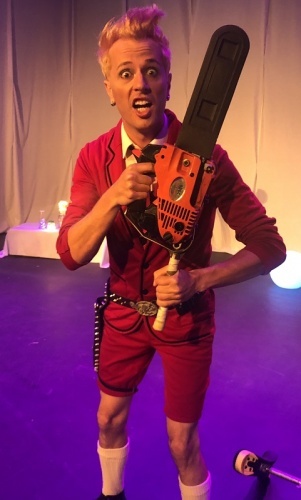 IDRIS Stanton is a performer jack-of-all-trades, with his one man show in Warehouse Circus’ Circus For Life Festival, which blends comedy, magic and circus performance with a soundtrack of flamboyant rock music. Decked out in bright red shorts and a blazer like a lanky public schoolboy, Stanton is a charming presence on stage, breaking persona to laugh or giggle with the audience so often that this became his signature. Stanton is a hilarious mimic and nimble circus performer, but compared to his skills here the magic tricks felt like a perfunctory add-on, a callback to past fads for comedy magicians. But the variety in the show ensured it stayed engaging by constantly trying something new, like a vaudeville bill performed by one person. In one moment, Stanton could be spinning plates of sugar on poles while Def Leppard’s “Pour Some Sugar On Me” plays, and in another he could be pulling one of the show’s reviewers onto the stage for a simple card trick and some comic banter. While some of the acts in the show were inspired by songs (I Still Call Australia Home is the opportunity for an impressive balancing act that involves a didgeridoo, a tiny QANTAS plane and a lagerphone), some acts were generic and tenuously connected to the music. Stanton is so likeable and charismatic, and the pounding rock music is so engaging that this grab-bag of acts came together in a delightful night of pure entertainment. DOUGAL MACDONALD reviews the new film 'Breaking Habits'.